Glass dining tables will enhance an artistic appeal to the dining room because of their sleekness. Rooms with limited spaces need to be made appear bigger. Such rooms can be made comfortable and stylish by use of glass dining tables. 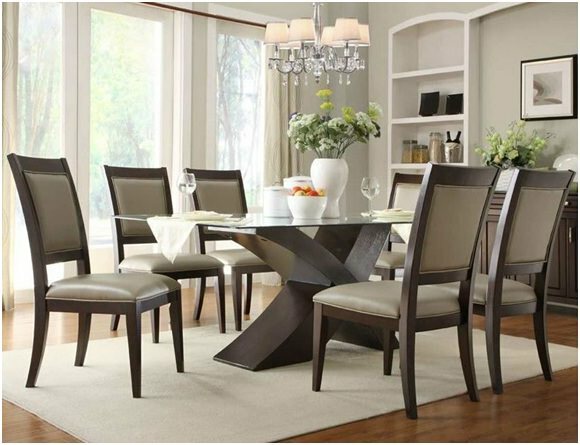 An overall advantage of glass dining table and chairs is the ease of cleaning. They are not vulnerable to stains as compared to solid oak dining tables. The downside of glass dining tables is that they are not as strong as stone or wood. However, tempered glass is stronger and can resist thermal shock. The furniture in fashion online store has various glass dining tables ranging from square, round or rectangular sets. They are also available in different colors. When space is needed, clear is the best option. Colored dining tables enhance character. Ceramics is more appropriate when looking for a colored table. Clear glass can work well with every décor colors and themes, therefore, a perfect solution if the dining room is filled with lacquered or wood furniture. Lacquered or frosted is best if the dining table should match the room color. A lacquered glass is glass coated with lacquer from the underside. Frosted glass, on the other hand, is clear glass that has been sandblasted or acid etched so as it turns into translucent. Lacquered glass come in more variety of colors. Smoked glass brings a sophisticated and chic look to the room. This is a transparent glass but has dark grey hue. 1. It is versatile as the 4 sitter table can be made a six sitter by adding a chair on either side without making it appear overcrowded. Makes the room appear more airy and larger due to its transparency, therefore, more space for adding splash color of the chairs. Makes the room brighter and fresher due to the spread light by the reflective surface. It might scratch. This can be the reason for opting for ceramics or frosted glass. In choosing the extended or fixed dining tables, space and the diners to be accommodated should be considered. Extendable tables are selected if the diners include the extended family or if a dinner parties are to be hosted. They are inherent space-savers when they are not in use. If extra space is needed in the dining room then the fixed tables are most appropriate. Ceramic dining tables are distinctive colored glass. They also have a reflective surface and like glass, can spread the light around the room highlights proximate items and brighten the surrounding. They are scratch resistant, unlike glass. Also, they are more costly as compared to glass. The furniture stores in the UK offer the spectacular collection of the various glass dining tables at reasonable prices worth checking. How spacious is the dining room? What is the color/style of the dining room? How often and what is the number of diners accommodated? What is the preference between the glass table that has the same color as the surroundings, and a transparent glass table that gives the impression of space? Are scratches on the table going to be a problem? Are ceramics, the scratch resistance tables a better option?